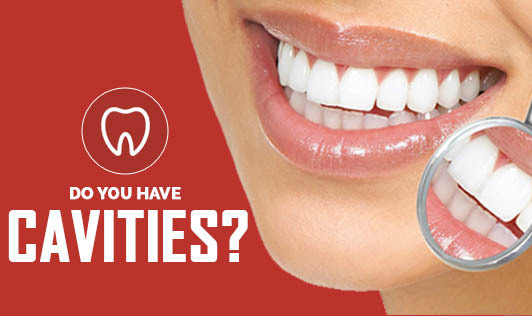 Cavities are among the world's most common health problems. These are damaged areas in the hard surface of one's teeth that develop into tiny holes or openings. Cavities are also referred to as tooth decay or dental caries that are caused by a combination of factors including bacteria in the mouth, not cleaning the teeth well, frequent snacking or a high intake of sugary items. Tooth decay and cavities are very common in children, teenagers and older adults and sometimes even in infants. • Tooth location: you'd notice how decay mostly occurs in one's back teeth (molars and premolars). These teeth have a lot of pits and crannies that are good for grinding food, but they can also collect food particles. These teeth are harder to clean as a result of which there is plaque build up producing acid that destroys tooth enamel. • Certain types of food and drinks that cling on to one's teeth for a long time such as honey, soda, raisins, cake, cookies, candy, chips are more likely to cause tooth decay than foods that are easily washed away by saliva. • Bedtime bottles filled with juice, formula, milk or other sugary liquids tend to remain on the teeth for hours before your baby sleeps, providing food to decay-causing bacteria. This is known as baby bottle tooth decay. • Inadequate brushing as well as insufficient fluoride can also result in tooth decay. • Dry mouth can lead to tooth decay as saliva helps to prevent tooth decay by washing away food and plaque from one's teeth. • Certain cancer treatments can decrease saliva production increasing one's risk of developing cavities. • Eating disorders such as anorexia and bulimia can lead to tooth erosion and cavities. The stomach acid from repetitive vomiting washes over the teeth and begins to dissolve the enamel. • Heartburn (GERD) and acid reflux can cause stomach acid to flow into the mouth, wearing away the enamel off one's teeth. • Worn out fillings or dental devices can also cause tooth decay as these begin to break down or develop rough edges thus contributing to the development of plaque. People are often unaware when a cavity is forming, so visiting your dentist regularly will be your best protection against cavities or tooth decay!